These places listed below are where Glencairn and Dunscore congregations, with many friends, have worshipped over the years, remembering those who gave so much to maintain the Presbyterian forms of worship and government. In July 1678 more than 5000 Covenanters gathered to hear Revs John Welsh (Irongray), John Blackadder (Troqueer), Samuel Arnot (Tongland) and John Dickson (Rutherglen) – all outlaws under sentence of banishment or death. A monument is surrounded by ‘communion stones’ where the Sacrament was shared. Born in Moniaive, James Renwick began his public ministry in 1683 at Moss of Darmead, Cambusnethan Parish. For just over 4 years during the ‘Killing Times’ Renwick stood firm and the pressure to have him apprehended grew. The Cowgate, Edinburgh was the place of his arrest – the captain of the guard, on seeing the youthful 26 year old, is recorded as saying: ‘Is this boy Mr Renwick that the nation hath been so much troubled with?’ He was taken to the gallows in Edinburgh Feb 17th 1688, and is interred at Greyfriars, Edinburgh. William Smith, a lad of 18, was neither a great preacher, nor a leader of the Covenanters. Smith was a young boy who remained loyal to his faith even when confronted, and on threat of death did not turn for his belief. The stone marks the place he was killed – it is not a remarkable stone – not easily seen, nor found! Just as the ordinary folk today need not have high position to be true to God. Smith was originally buried beneath the threshold of his family’s farmhouse. He was not allowed a Christian burial. However he was later interred at Tynron Kirkyard. Commemorates George Allan and Margaret Gracie. 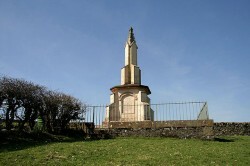 This monument was built in 1857 in place of the cairn which had marked the graves. which was perfect for gatherings. Grierson of Lag made a habit of searching out this location each time he was near; and one day he came upon a conventicle. Allan and Gracie were pursued, and when they did not swear the Oath of Allegiance to the king, were shot and left face down on the open moor. 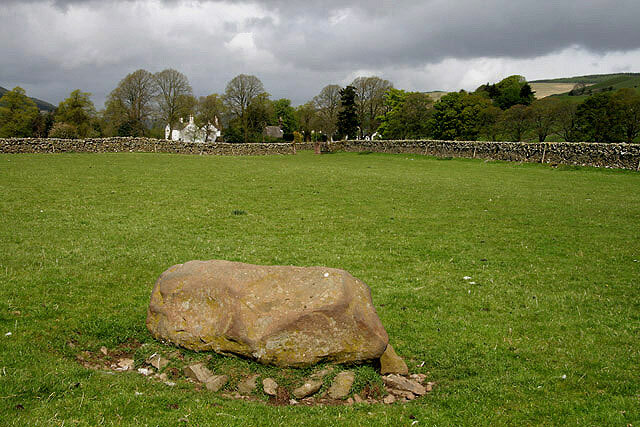 Later their friends returned and buried them at the top of the hill – Allan’s Cairn. Five friends – Robert Grierson, Robert Edgar, John Gibson, James Bennoch, and Robert Mitchell, were arrested and taken to Ingleston Mains Farm, where they were herded into a walled enclosure. After a swift trial they were deemed to be deserving of death and were shot where they stood. 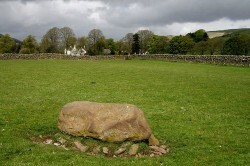 Friends took Robert Grierson back to his home area of Balmaclellan, the others were buried at Glencairn. Folks from the parishes of Durisdeer, Closeburn. Thornhill, Tynron, Keir, Penpont, Dunscore, Glencairn & Moniaive gathered; and friends from near and far at the Nithsdale Cross which bears the names of 57 martyrs. 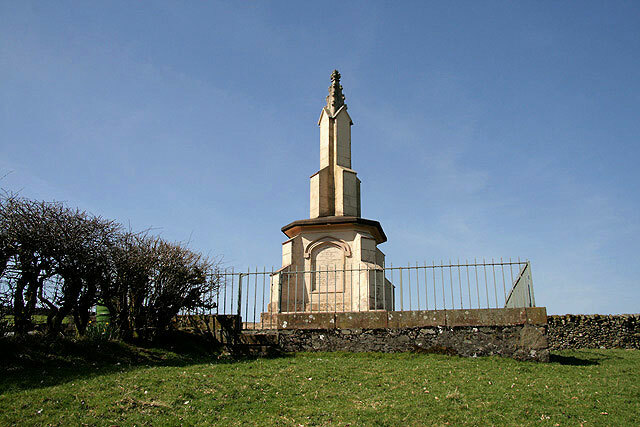 Eight men discovered at this spot – four were shot, four were arrested – of whom two were hanged at Hallhill (Irongray) and two deported to the West Indies. Six were martyred, the other two had their futures altered by persecution, yet retained lives strong through faith. The four who were shot were: William Heron, John Gordon, William Stewart and John Wallace. Edward Gordon and Alexander McCubbin were hanged at Hallhill. Robert Grierson and his un-named companion were taken from their families. 30 gathered beneath the 6 oak trees – so close to Lag Tower, you could imagine the fear and courage of Covenanters living here, let alone worshipping.